Look at this little guy - the vanquished dragon...isn't he fabulous? I am pretty sure that I fell for this dragon at first sight. He was created by Vittore Carpaccio from 1502 to 1507 for the Scuola di San Giorgio degli Schiavoni. 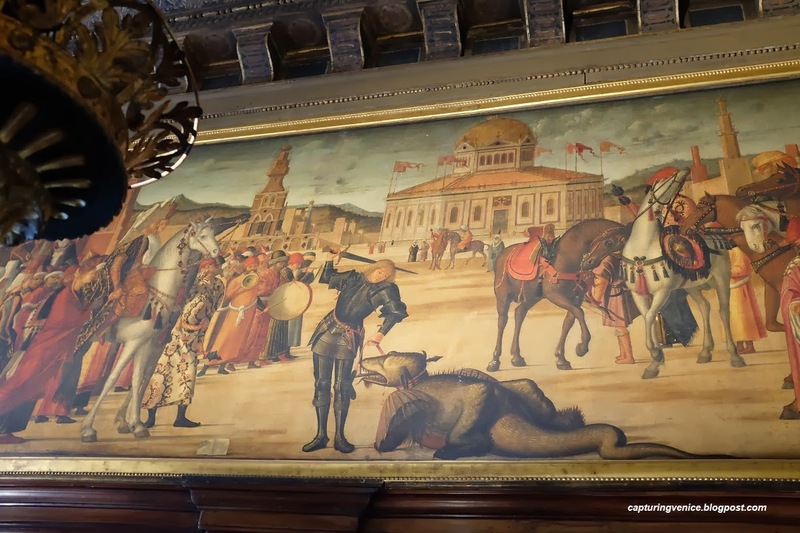 Carpaccio was commissioned to create seven panels depicting the lives of the patron saints of the Dalmatians (known as the Schiavoni) including St George, St Jerome and St Tryphon. From the outside, the Scuola di San Giorgio degli Schiavoni is an unassuming little white building alongside a canal in Castello. 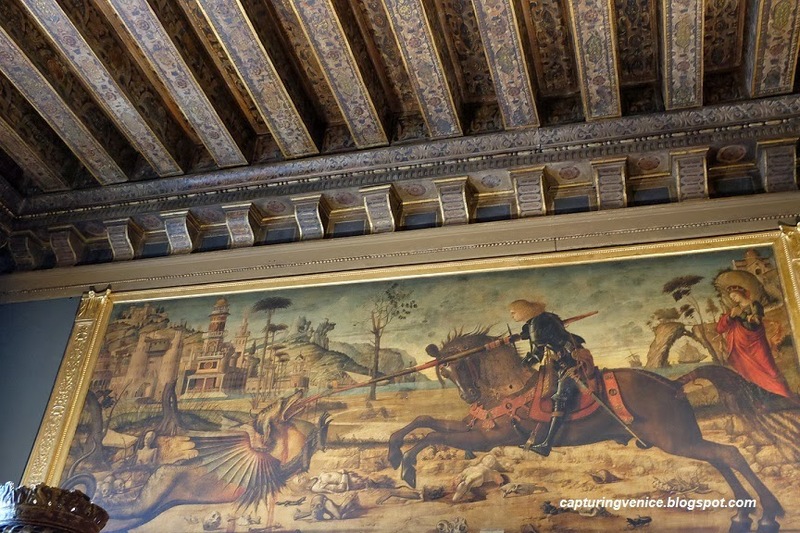 And then you step inside and KAPOW...Carpaccio's frieze is extraordinary. The first time I arrived in Venice, I'd read that one can't get the full measure of Carpaccio's work until visiting this scuola. I dutifully went along to find out more, and I have never gotten over the impact of these glowing, vibrant paintings, nor my delight in them. "…My eyes get used to the dimness, and as they do, my mouth opens in astonishment. The paintings against the dark wood are amongst the most striking I've ever seen…”. The last time I was in Venice, I stepped into the scuola, took some time to quietly absorb the impact of the paintings, and said a silent hello to this little dragon. After a while, I raised my camera to take a couple of shots, and then the caretaker hurried over to say that photography was forbidden Having spent a lot of time working in galleries and museums and asking people to stop taking photographs, I’m always happy to oblige when somebody asks me to do so. But it means I can’t show you a photograph of the other painting in this room that I adore: Carpaccio’s depiction of St Jerome appearing to St Augustine. In the painting, St Augustine is sitting in his studio reading, when he is disturbed by the voice of St Jerome. In the centre of the studio, watching and listening to the proceedings with great intensity, is a little white Maltese dog. Can you believe me if I tell you that this little white dog is even cuter than the dragon? It doesn’t matter that we don’t have a photo of St Jerome and his lovely dog, because we have Vikram Seth’s description of them instead. Vikram Seth describes St Augustine sitting in his "rich, calm study, lined with books, adorned with open music, where he sits alone with his gorgeous, impeccable, polite, adoring, curly-haired white dog, than which there is nothing more perfect or more necessary in this room, or in Venice, or in the world". I love that poor deflated dragon. And of course, the little dog! This is one of my favorite place in Venice and probably once of the best art experiences anywhere. What a magical place. Thanks for your post! Annie, thank you for stopping by and leaving a comment. I very much enjoy reading your Churches of Venice site.